So, we were granted a two-month reprieve. Then what? With the annual year-end hassle over the continuing threats of cuts in Medicare reimbursement I decided that my best choice might be to get out of the program. 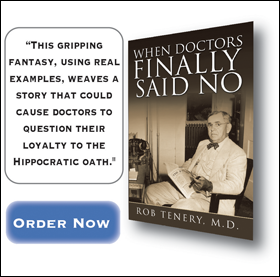 I had read where, in increasing numbers, doctors were leaving. So, why shouldn�t I? The reason for the discontent goes back to a flaw in the Sustainable Growth Rate Formula (SGR) that increases in volume mandate decreases in individual reimbursements to order to maintain budget neutrality. Feeling I could not afford the proposed 29.4 cut in my Medicare reimbursements, and with the growing frustration of fighting this same battle each year, I decided to look at my options. There were three: Continue to accept the fees the Congress decides to dole out to me.� Become a non-participating provider. Or opt-out of Medicare altogether.�Each of these latter two options has very different consequences for the physician. Section 1802 of the Social Security Act, amended by Section 4507 of the BBA of 1997, allows physicians to opt-out of Medicare and enter into private contracts with their patients if specific requirements are met. In this situation, no services provided by an �opt-out� physician are covered and no payments are made to that physician directly or on a capitated basis. The beneficiaries or their representatives must not submit a claim for these services either to Medicare and Medigap plans, but can submit these claims to any other carriers. The patients must also agree to be responsible for the payment of these services and acknowledge that the physician is not constrained in the amount of the charges for their services. Additionally, no payments will be made to the beneficiaries for these services by any Federally funded program. So, what happens if Physicians, in even larger numbers, drop out because they can no longer afford to be part of the Medicare program? What happens when the patients cannot afford to go without it? What happens if such a large sector of our population goes �uncovered� that it is considered a threat to public health? One only has to look at the proposed legislation in Massachusetts that links state licensure to participation in The Massachusetts Health Care Insurance Reform Law of 2006 (RomneyCare) to understand how close this country has come to a total government take-over of the medical profession. Maybe the leadership in our nation�s capitol knew it could come to this all the time.